In order to encourage players to wander around in the great out-doors of Rubi-Ka, "dyna-camps" were introduced. These are "camps" are comprised of a glowing boss that are often surrounded by a group of regular mobs of the same type. There are two main reasons why players would care about dyna-camps. First, the boss will give far more XP than regular mobs at the same level, and the mobs respawn quite quickly. 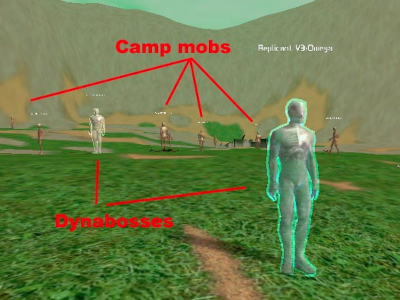 Thus, dyna-camps provide a lot of XP, and can often be quite challenging when the level range of the regular mobs are high enough such that they will attack you or your team on sight. The second reason why players are interested in dyna-camps is that the boss has a chance to drop many items that can not otherwise be purchased or obtained as a mission reward. (See our guide on Rubi-Ka missions and Clicksaver.) These items include: Nova Dillon Armor, Kirch Kevlar Armor, Sekutek Chilled Plasteel Armor, various Nano programs (usually in the form of instruction discs and including the much desired Nano Crystal (Nullity Sphere) and Nano Crystal (Nullity Sphere MK II) and the fabled Grid Armor. ), Empty Data Receptacle Container, and profession/breed locked weapons that are desired for their usefulness in low-level PvP. Also note that the regular mobs at dynacamps will drop items that are typical for that type of mob. For instance, cyborgs at dynacamps will drop Miy's Armor just like any other cyborg anywhere else on RK. 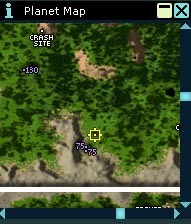 If you use Atlas of Rubi-Ka (AoRK) then you can locate dyna camps by zooming into the map and locating the magenta dots with numbers above them, as show in the screen shot below. In the screenshot above, there are three dynacamps. The number indicates the approximate level of the dynacamp boss. The regular mobs will be 5 to 10 levels below the boss. Alternatively, there is a table at the bottom of this guide listing nearly all the dynacamps on Rubi-Ka. The screenshot above shows two dynacamps with identical monster types that are in close proximity to each other. Notice the two bosses in the image. Each glows with a different color. The color provides you information about characteristics of the boss. Light Yellow Lands critical hits on you very often. Note: the above colors also apply to Rubi-Ka team mission bosses as well. Some bosses are stationary (will never move from the spot they are standing on -- particularly true of higher level bosses) and they will warp you to them if you try to run away, while other bosses will chase you around when they attack you. Now that you understand that dynacamp bosses can be hard to kill and they are often (not always) surrounded by mobs that respawn quite quickly. You might want to adjust your strategy to insure you (and your teammates) survive an encounter with a dynacamp. If you are high-level and the regular mobs (or even the boss) is so far below your level that their HP bars are grey to you, then none of the following advice is necessary. The regular mobs will not sympathetically aggro you when you attack the boss, and you are probably so powerful that you can kill the boss in a few hits because you are so much higher level than the boss. Obviously, working in a team will improve your chances of successfully killing a dynacamp boss. Identify a side of the camp that has fewer mobs and begin carefully pulling the mobs away one at a time. Kill the mob you have pulled, and repeat the process until you have a clear line to the boss. Then carefully pull only the boss away from the camp, so that you can take your time killing the boss. Note that all dyna camp regular mobs will wander around a bit. It may take some time to clear a path to the boss. This is great for practice careful pulling. It is usually possible to slowly approach the camp and pull away a single mob. If your profession has calms or roots, you can carefully pull the regular mobs far away from the camp and calm or root them there. When the calm or root wears off they will be so far away that they will have lost aggro and simply stay in the area you have pulled them. Because you didn't kill them, they will not respawn at the camp. Because they are regular mobs, they are susceptible to calms and roots. Calming or rooting all the mobs at the camp and then pulling away the boss is another good strategy, but some bosses will not move from the camp. Dealing with a tough boss often involves some "kiting" (running around while fighting). If you need to kite either the regular mobs or the boss, it is a good idea to do so away from the camp. For instance, Nanotechnicians can usually wipe out the entire camp with their area-of-effect nukes, leaving only the boss to kill because it often has far more HP than the regular mobs, however, if you continue to kite at the camp, the regular mobs will start to respawn and you may find yourself kiting forever. Bosses can be rooted or snared. Dynacamps are great locations to learn your profession's tool set and learn proper pulling technique as well the art of kiting. Happy hunting!